Every industry vertical is unique, with specific products and services, terminology, sales and marketing channels, trade media, etc. But at a higher level, many industry vertical markets share common marketing challenges related to developing an overall strategy, creating awareness and demand, communications, positioning, and differentiation. Getting deeper into a specific industry vertical is one of the fun and interesting aspects of marketing. This is especially true in the world of B2B industry vertical marketing. If you’re in any of the industry verticals mentioned above, or perhaps something different, let’s talk about your specific marketing challenges. If you’re looking for an industry vertical marketing consultant in southeast Michigan, including Ann Arbor and Metro Detroit, let’s meet over coffee or other suitable beverage to discuss your project. 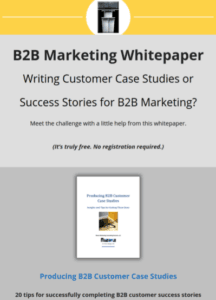 Click the image below to reach a page where you can get a free iBeam whitepaper on the topic of writing B2B customer case studies. It’s an immediate PDF download from there… no email registration required. This post introduces why B2B sales teams want this, and introduces several software vendors providing these tools.